We create a wide range of banners and flags including custom banners with vinyl graphics or custom made banners, hand painted, Fluoro advertising banners and Digitally printed banners. 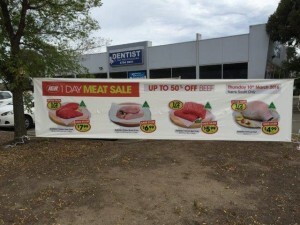 Banners are the all time best value sign for the money, they are extremely versatile in there usages. Real estate signs and the list goes on. We can supply banners as a temporary sign with ropes and eyelets, so they can be easily installed anywhere. We also do banners with a kadar edge which can be installed on a permanent basis with aluminium rope track. We cover all signs Melbourne wide. 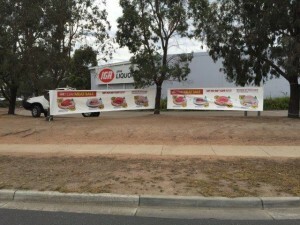 They can be supplied as a do it your self sign kit or we also offer a sign installation service Melbourne wide. 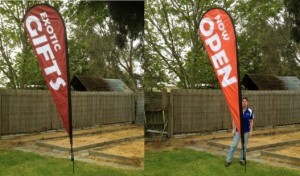 Flags can be made in a wide variety of different configurations these days. 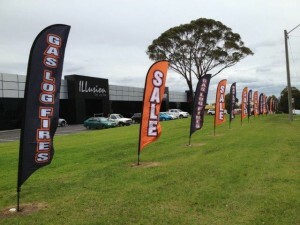 Custom flags, tear drop flags, real estate flags can be used as promotional signage for retail, event signage,show signage, trade show signage and special event signage. 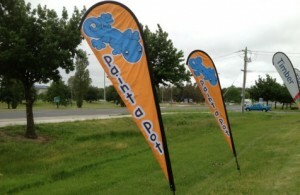 They are highly visible in crowds, so they are great as a promotional sign at trade shows etc.We can design a banner or flag to suit your needs at our sign shop Narre Warren. Our design Team can create a design that really works.